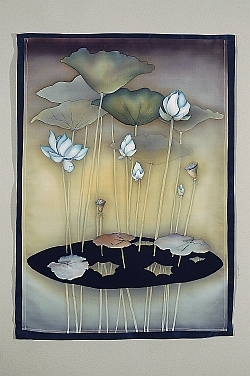 Betsy Sterling Benjamin, associated with Aryaloka Buddhist Center in Newmarket NH, is showing her silk wax-resist hanging titled: “Blue Lotus of Lumbini”, a piece inspired by Bhante Sangharakshita's “Lumbini” poem. The exhibit is at the Main Gallery of the Paul Creative Arts Center, University of New Hampshire from September 8 to October 17, 2007. For more information call the Gallery (603) 862-3712. Blue Lotus was last shown in the “Song of the Buddha Heart” exhibition at the Manchester Buddhist Centre, England during February of this year. It was also featured on the cover of Fiberarts Magazine in April-May 2007. and was selected with 90 other objects to be included in the 25 Biennial League of New Hampshire Craftsmen’s Juried Members Exhibition. More of Betsy's work can be viewed here or on the FWBO Flickr site here. Than the broken Ashoka column, or ruined shrine.